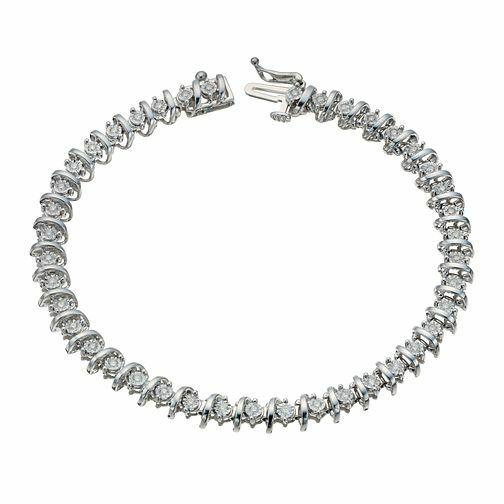 Be glamorous, with this chic 9ct white gold bracelet, beautifully illusion set with dazzling diamonds. Designed to add a fresh, youthful and indulgent finishing touch, whatever the occasion. Elegant jewellery, designed to dazzle. 9ct white gold 0.50ct diamond illusion set bracelet is rated 5.0 out of 5 by 2. Rated 5 out of 5 by Anonymous from Beautiful Bracelet The bracelet is very well made and looks way more expensive than it is. The pictures really don’t do it justice. My wife wears it all the time, it’s her favourite piece of jewellery.